Here you can learn how to reach media handlers, handle devices and attach them to the call object and how to create a console application for Interactive Voice Response (IVR). You want to create your own application to reproduce this solution, You have to create a new console application in Visual Studio. This class is for handling the incoming calls of the IVR. then make softphone and phone line object by using IsoftPhone and IPhoneLine interfaces. The most important method in the Softphone class is the Register method which allows you to register your SIP account to the server. The method gets the registrationRequired, displayName, userName, authenticationId, registerPassword, domainHost and domainPort parameters and use them to create an SIP account with the constructor of the SIPAccount class. Then the system can create the phone line (CreatePhoneLine method) with the help of the account and it can register the phone line. This class is used to managing the incoming calls for the IVR system. If there is an inbound call, then the caller will hear a greeting message through the speaker and he/she can choose between different menu items by using DTMF buttons. We need to create some objects to manage the incoming calls of the IVR. These are the call, mediaConnector, audioHandler, phoneCallAudioSender and greetingMessageTimer objects from the ICall interface and the MediaConnector, AudioHandler, PhoneCallAudioSender and Timer classes. You can find more details about these features of the Ozeki VoIP SDK here. The constructor of the class gets an ICall type parameter and it makes the basic setups for the class. It sets the interval of the greetingMessageTimer (30 seconds), what is for repeating the greeting message on the main menu level and it attaches the phoneCallAudioSender to the call. A method is a code block that contains a series of statements. One of the most important methods of this class is the Start() method because that will be called by the main method of the program. In this method we subscribe on the CallStateChanged and DtmfReceived events and accept the call. The call state change event is one of the most important events to notice. This informs both the server and the client about a change in the call state. The DTMF received event informs the server about the client pressed a button on his/her phone because he/she want to step into another menu level. Dual-tone multi-frequency signaling (DTMF) is used for telecommunication signaling over analog telephone lines in the voice-frequency band between telephone handsets and other communications devices and the switching center. In the Start method we subscribed on the DtmfReceived event with the help of the call_DtmfReceived() method and we can set what happens when a client press a DTMF button. In this example if you press the button one, than you can hear more information about the Ozeki Ltd. and the Ozeki VoIP SDK with the help of the constructor of TextToSpeech class. By pressing button two, you can hear a sample mp3 song by calling Mp3ToSpeaker method. With the TextToSpeech method you can add a your text message what you want to hear, read by the TextToSpeech engine. Just make a TextToSpeech object, connect it to the phoneCallAudioSender with the help of the Media Connector and call the AddAndStartText method. For the description of the TextToSpeech function of the Ozeki VoIP SDK, please visit this page. By using the functions of the MP3ToSpeaker method the IVR can easily play the contents of a sample mp3 file to the caller (for example a welcome message in mp3 format). Only need to create an MP3StreamPlayback object with the file path parameter, connect it to the PhoneCallAudioSender via the mediaConnector and start the streaming (Start() method). This class will introduce the usage of softphone and callHandler objects and handles the console and DTMF events came from the user. In the Main section you need to create the softphone object to reach the created methods in the Softphone class. Then there will be some instructions to the code and the call of the sipAccountInitialization method. We can add our SIP account values in this section. Then we need to subscribe on the IncomingCall event for handle the incoming calls. So you need to add your SIP account values for the program and it will call the Register method of the Softphone class with these values. If the readWhileEmpty is false, that means there is a default value of this component (for example 5060 for the Domain Port) so the input can be empty or null. Else you need to add an (correct) input for the system and the function will return with the input to the Main method. If we would like to be notified when there is an incoming call, we need to set an event for this purpose. This is the IncomingCall event. When the event notifies that there is a call waiting to be accepted, in this case the call has to be accepted by the IVR system. In this method there is a callHandler object for managing the metehods of the CallHandler class. If there is an incoming call, then call Start() method of the CallHandler. 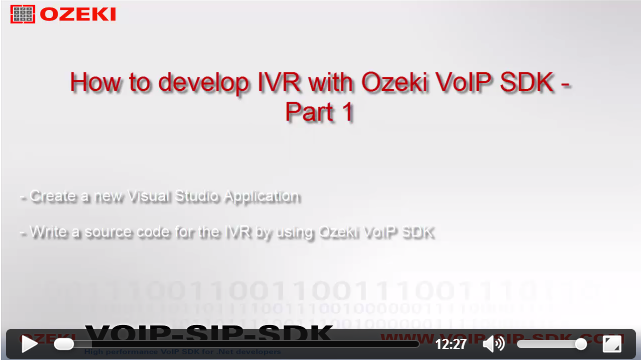 After reading this documentation and studying the source code, we must be familiar about how to add reference to the Ozeki VoIP SIP SDK and how to create a basic IVR system with the help of the elements of this SDK.